A no money down mortgage allows you to buy a home with little to no money due at closing. With some lenders, no money down means that no down payment is required, but closing costs are. 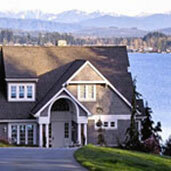 U Other lenders offer home loans where no money, not closing costs or down payments, is required. Instead, closing costs are included into the principal amount, usually up to 2% of the loans value. With Top-Lenders.com you can compare no-money-down mortgage programs both for perfect and adverse credit rating situations. Run the numbers on our website to get an idea about no-money-down loans rates, payments and closing costs.